Black Swan — starring Natalie Portman, Mila Kunis and Vincent Cassell as professional ballet dancers whose lives revolve around staging the most guttingly pure and potent production of Tchaikovsky’s Swan Lake — is the latest cinematic opus offered by Darren Aronfsky, a still-young director who is definitely keeping on his toes. And here’s the thing about Aronofsky (and I hope he would hear this as the high compliment I intend it to be): I am never in the mood to watch his films, yet they win me over every single time. See, I’m a pretty stressed-out guy, frequently beleaguered by dragging around an interminable queue of ambitious projects and almost never disposed to sit down and contemplate a cinematic experience wherein the protagonists are coping with similar burdens times-one-thousand (and this is exactly what Aronofsky’s protagonists almost always are.) Yet, on every occasion where his films are put before me — because a friend is begging to pop the DVD in, or because it’s the only unwatched disc left in the house — I relinquish, looking forward to two or so hours of I’m-not-in-the-mood-for-this, but finding myself pleasantly ambushed instead by two or so hours of whoa-mood-or-no-mood-this-is-compelling-as-all-get-out. 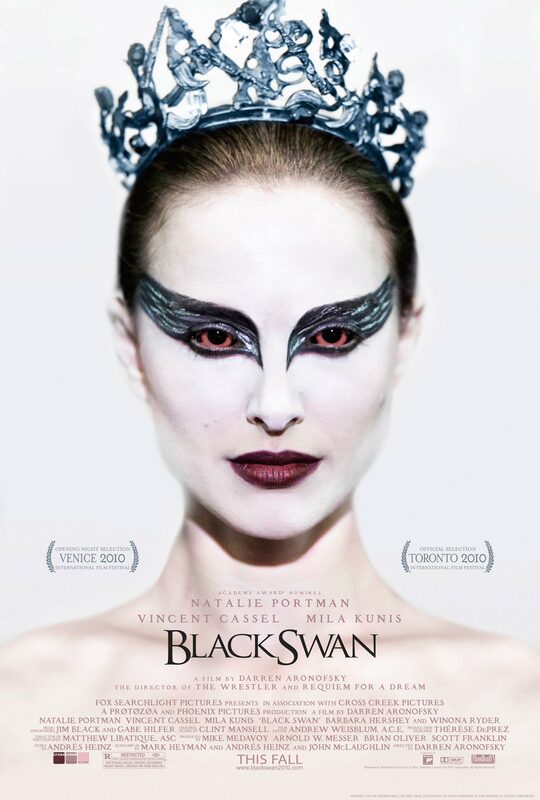 The point is that Black Swan is not only right in-step with Aronofsky’s previous productions, it builds his career to a gracefully intense crescendo of the same themes he started with — taking the hyperfocus of Pi, the dangerous mania of Requiem for a Dream, the surreal existentialism of The Fountain, and the dogged persistence of The Wrestler and weaving together these thematic swatches, all while upping the tempo and crying “Forte, forte, forte!” That is to say that it’s good; good enough that you can be in the exact diametrical opposite of the right mood for some film about ballerinas, get snookered into buying a ticket, and never ever regret your awesomely fortuitous moviegoing decision. The story is not only centered around the production of Swan Lake, the classically classic ballet, but it is Swan Lake. Cubed. And inverted. In Natalie Portman’s mind. That’s as much plot detail as we’ll allow here, but let’s take the time to laud Andres Heinz, to whom the film’s story is due, for paring Black Swan‘s narrative world down to its essentials: the stage and the home. Almost the entirety of the action takes place in these two places, and in them the core of the protagonist — her angsty hopes, fears, and solitary, single-minded perfectionism — is sharpened to a sympathetic point, which the film uses to scratch its existential poetry into the walls of the audience’s mind. Natalie Portman, who ditched her Garden State and Luke Skywalker’s mom avatars somewhere along the path from V for Vendetta to Hotel Chevalier, is our graceful and tormented protagonist — and she acts the hell out of this role. You might’ve gawked at the grotesquely make-upped portrait that serves as the film’s poster or watched a trailer visually pitting Natalie-the-White-Swan against Natalie-the-Black-Swan and thus developed an expectation to see her incarnate two roles — but you’d be wrong. Instead, we have a character who follows a single one-way arrow, whose trajectory goes from immaculately straight to a twisting downward spiral carrying her to rock bottom and, finally, a sort of resurrection. An actress who clearly owns the role, Portman is responsible for the successful tracing of this course all the way. Presentationally-speaking, it is my opinion that the cinematographer is almost wholly responsible for selling the experience of this film. If it were, indeed, “some film about ballet,” then we’d be in for the sum of all our impatient audience member fears — longish, boring stretches of ballet on film, costing many hundreds of bazillions of dollars more than your mom’s smartphone footage from the wings of Ballet West, but not much less snore-ific. But Aronofsky and his camera crew would have none of that, instead favoring a consistently un-steady camera that walks alongside or just behind our characters as they strut or bustle through the halls of their forboding artistic temple and which, most importantly, dances alongside, around, over, under and through them as they dance on its scenic altar. The shakiness is unsettling, as it should be, and the motion pulls the snoozing audience member out of his/her seat and whisks him/her along in a metaphysical cinematic vicariousness by which uncoordinated wallflowers like myself can’t help but be fascinated. This was, and may ever remain, the single most stressful cinematic experience I’ve endured since BBC’s The Office Christmas Special (Tim and Dawn, why must you take years off my life!? ), but, again, the anguish is worth it. Though Black Swan‘s moments of microgore, psychological terror, and acutely intimate sensuality make for an exquisitely grisly and harrowing narrative, even these peaks (or troughs, depending on your point of view) of “content” are all significance and pathos, narratively defensible and arguably inevitable. The careful and conscientious viewer should take such content into consideration when determining the time and place to approach this film — and I’d definitely say that time should at least be somewhere after age 18, or never if you’re one of those people who laughs like an awkward child whenever something potentially titillating or brutal comes onscreen. If Requiem for a Dream was a cautionary proxy tale meant to dissuade anyone and everyone from getting mixed up in illicit drug culture, then Black Swan, a cautionary tale in its own right, has made fully sure that I will never ever try doing ballet — not even at a party.